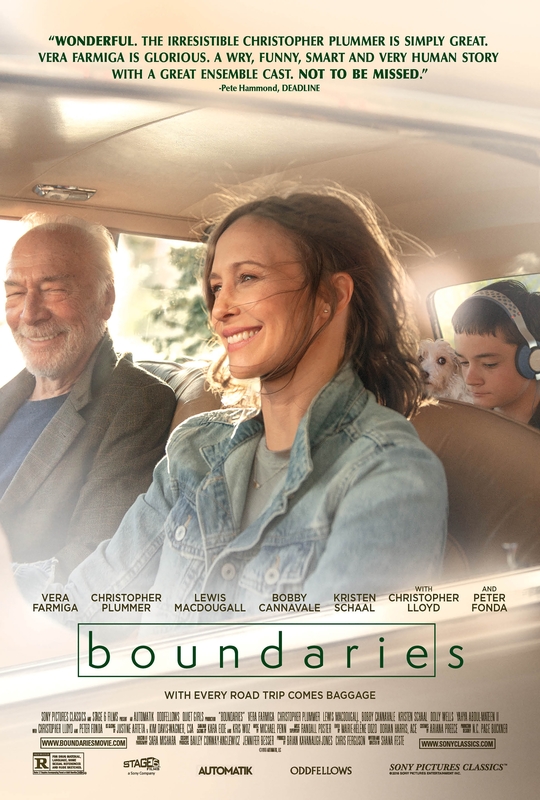 I’m often asked to review dog-related products, treats, and food, but earlier this month, I was asked to do a movie review for a Sony Pictures movie called Boundaries. I was intrigued. Me, do a movie review? Why on earth would Sony Pictures ask me to screen a movie? Curiosity got the better of me and instead of automatically deleting the email, I opened it. It became immediately clear why: DOGS. Dogs (and a few cats — one naked kitty, even) show up in the movie all over the place. Laura (Vera Farmiga) is a single mother living in Seattle, who has a constant need to put others & animals before her. When her estranged, criminally-minded father Jack (Christopher Plummer) is kicked out of his retirement home, Laura agrees to drive him down the coast to live with her sister JoJo (Kristen Schaal) in LA. Along for the ride is her bright but troubled son Henry, and an assortment of animal charity cases. Without telling Laura, Jack convinces Henry to help him sell off his copious supply of marijuana at every stop of their journey, resulting in unexpected reunions with old friends and family. The movie is well-written, has an interesting plot (and some hilarious sub-plots) and uses the dogs (and kitties) in a way that they’re important to the movie, but aren’t the center of the plot. It’s the backstory, and behind-the-scenes details, though, that I almost always find the most interesting. Another interesting aspect of Boundaries was the casting. Once the funding was confirmed and the wheels of production began to turn, Feste and team set about casting. The tone of the script called for actors who could thrive in dramatic situations, but who could also deliver the comic moments that would ultimately define the film. All the actors in the film were Feste’s first choice. The actor cast as Laura’s son sort of steals the screen in Boundaries. Instinct helped Feste cast the role of Henry, Laura’s 12-year-old son who is an intriguing and endearing mix of innocence, smarts, bruised feelings, and deadpan wisdom beyond his years. “I really didn’t want that very self-aware “kid actor” style,” says Feste of her search for Henry. Not surprisingly, the quiet stars of Boundaries are the canines. Just as they included bios of each human actor, Sony Pictures sent a bio for each animal actor with the Boundaries press package, as well. I didn’t include them all here, but I found that element so endearing (that they wrote bios for each animal in the film), that I felt it important to include a few. Loretta is a terrier rescue and loves napping, stealing food from babies and being held. Loretta was the happiest dog on set because she was finally allowed to go to work with her mom, who directed the movie. The only problem was when her mom would yell, “Action!” Loretta would immediately run to her behind the camera so the first AD had to call action in the scenes Loretta stars in. Loretta made every dog jealous when she got to kiss Christopher Plummer on the lips – she nailed it every time. Squirt plays the part of “rescue puppy” along with littermates that looked similar. The pups were sixteen-week-old chihuahua mixes and got a ton of attention behind the scenes. So much so that the animal wrangler had to act as security when too many crew members swarmed around them – but they were happy to have all the love! I had a great time screening this movie. Because I’m so entrenched in the dog world, most of the time it’s hard for me to watch movies with dogs because I can read body language and most of the time it’s easy for me to see dogs who are uncomfortable in that filming situation. The dogs in Boundaries were not only comfortable, but most often seemed to be having a really good time with the actors in the movie. There was a premiere in New York City on June 11 and all the actors, along with the crew were there — with dogs! In addition, there were other celebrities known for their work with rescued animals were there, as well. The Boundaries movie was released on June 22 in Los Angeles and New York and will be in theatres after that. If you see the movie, let me know what you think in the comments! Laurie Luck has twenty years of immersion in the World of Dogs. She earned a M.A. in psychology, served as President of the Certification Council for Professional Dog Trainers (CCPDT), and is Faculty at Karen Pryor Academy for Animal Training and Behavior. A speaker at local and national educational events, Laurie is forever open to learning. In addition, Laurie raises puppies for a service dog organization, and loved nothing more than to work with her Labrador, Tango, as a certified therapy team.